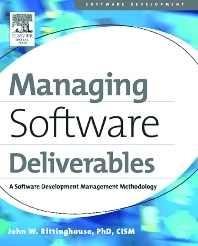 Managing Software Deliverables describes a set of proven processes for establishing an effective Software Program Management Office (SPMO) function in a corporate setting. Every business that has people performing Software Project Management (PM) activities has a need for these processes. In some instances, an organization may already have a PMO chartered with overall responsibility for each project managed in an enterprise. In those cases, this book will either provide validation of their efforts or it will provide some techniques and useful approaches that can be utilized to further improve on their overall implementation of the PMO. In the vast majority of cases in business, however, a PMO is unheard of. Each project managed in the enterprise is unfortunately managed separately from all others (at great cost in both time and money to the enterprise).